Professor Emeritus Allan Wild led the disciplines of Architecture and Planning for more than two decades. Architecture building and Conference Centre, from the 1983 School of Architecture Prospectus. Courtesy of the Architecture Archive, University of Auckland Libraries and Learning Services. The School of Architecture and Planning honours the life of Professor Emeritus Allan Wild, who served as Professor of Architecture, Head of the School of Architecture and Dean of the Faculty of Architecture (and successor faculty configurations) from 1969 until his retirement in 1993. He died shortly before his 92nd birthday. Allan was born in Feilding and grew up in Lower Hutt. In 1945, he moved to Auckland to study architecture. He was part of a lively cohort, some of whom formed the Architectural Group in their second year, writing a constitution and a manifesto and publishing the first issue of a magazine. From 1949, he and others extended one of the Architectural Group’s aims by forming the Group Construction Company. With parental backing, they designed and built three modern houses on the North Shore. Media attention generated clients and the collective became the better known Group Architects, designing some of Auckland’s most admired mid-century modern houses. Allan remained with the Group until 1952. 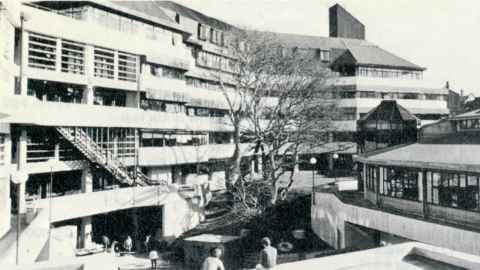 He then returned to Wellington, where he practised as an architect in both public and private capacities, including producing his best known urban building, Jellicoe Towers on The Terrace (1964-65). He moved back to Auckland in 1969, to take up his position with the University. The first half of Allan’s tenure was dominated by efforts to accommodate growing student numbers, culminating in the construction of the current Architecture and Planning Building and its low-rise administrative wing (now known as the Conference Centre), both designed by KRTA and opened in 1978 and 1982 respectively. The second half of Wild’s time at the University coincided with an economic boom and a sharemarket crash. The faculty was influenced by the rise of postmodernism in architecture and planning, increasing diversity among staff and students, the beginnings of the digital age and emerging interests in sustainable design. Allan was the last surviving member of Group Architects. After his retirement from the University, Allan returned to architectural practice under the name Architects Wild. He is survived by the seven children he had with his late wife Patricia (née Drawbridge), 13 grandchildren and two great-grandchildren. His sons – Max, Bruce and Adam – are all architects, while daughter Jane Wild is a former CAI Faculty Librarian. Grandson Sebastian Clarke is the most recent family member to graduate from the School of Architecture and Planning.